Zion Market Research has published a new report titled “HVAC Systems Market by Heating Product (Heat Pumps, Furnaces, Space Heaters, and Boilers), by Air Conditioning Product (Room/Unitary Air Conditioners, Chillers, VRF Systems, Coolers, and Others), by Ventilation Product (Air Filters, Air Purifiers, Centrifugal Fans, Roof Vent, Ventilation Fan, and Air Handling Unit), and by Application Area (Residential, Commercial, Manufacturing, and Automotive): Global Industry Perspective, Comprehensive Analysis, and Forecast, 2017 – 2024”. According to the report, the global HVAC systems market accounted for USD 169.8 billion in 2017 and is expected to reach USD 265.2 billion globally by 2024, with a CAGR of around 6.9% between 2018 and 2024. Heating, ventilation, and air conditioning (HVAC) systems provide heating and cooling services. These systems control the indoor air quality, humidity, and temperature of buildings and vehicles. HVAC systems are used in commercial, residential, and industrial buildings. The automotive sector has advanced at a notable rate during the last few years. Increasing usage of HVAC systems in passenger vehicles is expected to fuel the growth of this market. In 2017, the global vehicle production was 97,302,534 units, about 2.36% more than 2016. Additionally, in 2016, the global motor vehicle sales were about 94 million units as compared to 90 million in 2015. The Asia Pacific region is expected to be the major contributor to this growth. Thus, surging demand for motor vehicles will drive the HVAC systems market during the forecast timeframe. Escalating demand for VRF systems is anticipated to fuel the growth of the HVAC systems market during the estimated timeframe. In 2017, VRF systems’ sales witnessed a growth of almost 25%. This growth was attributed to the increasing investments made in the commercial construction sector. Furthermore, in 2016, the global construction industry was valued at USD 8.8 trillion and is projected to reach USD 10.1 trillion in 2021. With rapid urbanization in developing countries, increased product demand during the forecast period is evident. Thus, increased VRF systems’ usage is expected to fuel the HVAC systems market during the forecast period. By the application area, the global HVAC systems market is divided into residential, commercial, manufacturing, and automotive. The commercial segment is anticipated to hold a substantial share in the HVAC systems market during the forecast period. This is due to the increasing demand for office spaces and global expansion of various organizations. Air filters, air purifiers, centrifugal fans, roof vent, ventilation fan, and air handling unit forms the ventilation product segment of the HVAC Systems market. The roof vent segment is projected to show a rate of growth considerable in the forecast timeframe, owing to growing investments made in the manufacturing sector. Europe is anticipated to witness a considerable growth rate in the HVAC systems during the forecast period. Rising demand for these systems is expected due to the growing regional manufacturing sector. In the last quarter of 2017, Europe’s manufacturing sector witnessed a growth of about 4.9%. Similar growth is expected during the forecast timeframe. 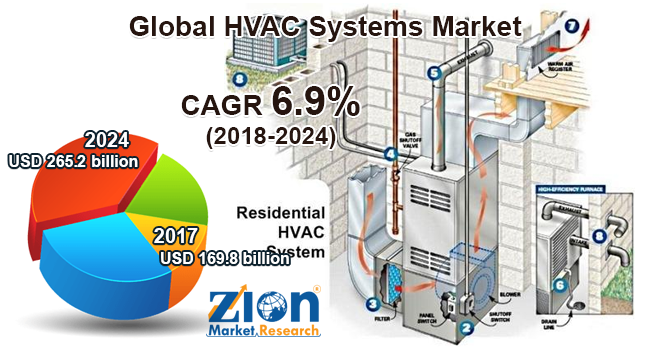 Some prominent players in the HVAC systems market are LG Electronics Inc., Daikin, Honeywell, Emerson, Electrolux, United Technologies, Johnson Controls, Ingersoll-Rand, Nortek, Lennox, Samsung Electronics, Hitachi, Mitsubishi Electric, Panasonic Corporation, and Whirlpool, among others.